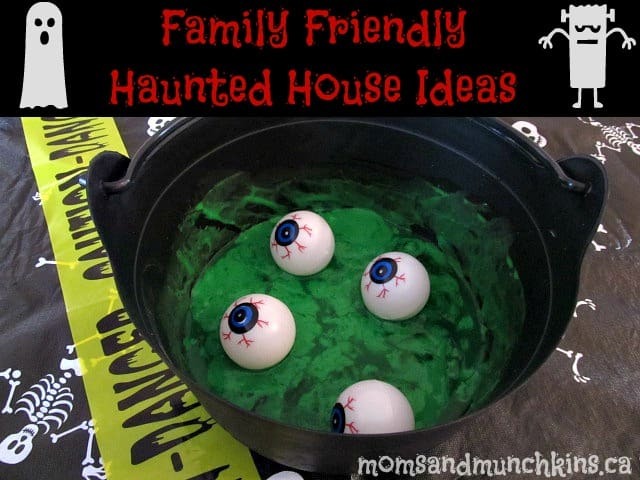 Your little ones will love creating a haunted house for their friends and family to enjoy. Here are some fun ideas to try at home. Create slime (click here for the recipe) and pour into a witch’s cauldron. You can then hide plastic eye balls in the slime mixture. Now here’s the part where you can have fun with your guests! First blindfold the guest, then bring out the slime mixture, have the guest reach in and try to find a “hidden prize” (the plastic eye) and have them guess what it is. Then remove the blindfold for the surprise! Your entrance way to the party can be covered in yellow caution tape. Replace your entrance way light with a spooky colored light bulb like red. You could also set up a motion sensor Halloween statue to frighten welcome guests to the haunted house. A dark entrance way could be covered in cotton spider webs for the guest to get tangled in walk through. Have a family member dressed in costume that can pop out of a closet (or from behind a door) to surprise guests upon their entry to the haunted house. A dry ice fog machine is a great addition when creating a haunted house. When creating a haunted house, you’ll want to make sure the spooky area is dark . Turn off the main lights in the house and replace them with colored light bulbs in lamps (this will help to make the room darker and spookier). Plan an “unexpected” power outage (assign one family member to turn off the electrical breakers) in the party area. Guests will then see the secret messages you left using glow in the dark paint on the walls. A large roll of white paper or an old white sheet can be used as your glowing art canvas to hang on the wall. Does your family have a tradition of creating a haunted house at home? 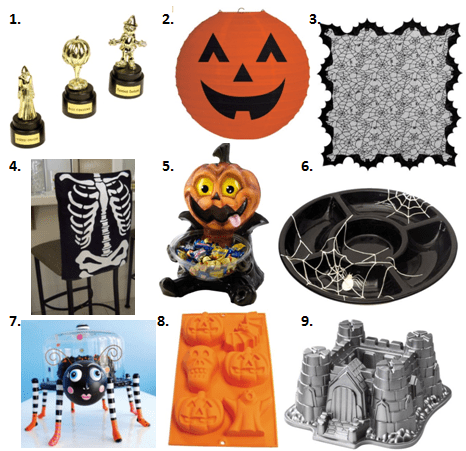 What are your favorite haunted house tricks or decorations? Stay updated on all the fun ideas for every holiday season by following us on Facebook, Twitter, Pinterest and Bloglovin’. Where do you come up with these great ideas? Before finding you, I felt sorry for my kids. Now, my friends are asking me what we’re doing next. Thanks for helping with creativity in this house! SO COOL!!! Have I told you lately how much I love your blog!?!?! Aww, you’re too sweet. Thank you so much! I love Halloween parties. We had a neighborhood one not too long ago. We certainly could have used some of your ideas. I like the power outage. 🙂 All in good fun! I love all you Halloween ideas. There is nothing more fun than this time of year. Happy Halloween! Cheryl, I totally love these ideas! Thank you so much for sharing and joining us at Best of the Weekend! Pinning and sharing today! Hope you have a happy Saturday and a wonderful weekend! i love the spider cake stand!!!! !Thanks for the ideas! Came over Cheerios and Lattes party! What great ideas! Especially love the eyeball goop, how fun! Thanks for sharing the additional items, I had no idea halloween themed trophies existed! What great ideas! My name is Katie and I host Fall Into the Holidays, open Saturdays! I’d love to have you link up! Thank you for all these fantastic ideas. My little boy would love that game with the slime and plastic eyeballs. Pinned! My girls LOVE Halloween. They can’t wait to decorate for it this year. What great ideas to do with them. I think that they would really like the eye balls. They are always looking for ways to gross dad out. Thank you so much for sharing. I can’t wait to try a few. You definitely know how to have fun at Halloween 🙂 Thanks for sharing these ideas with Afterschool – I’ll be featuring them in my host round up next Monday. I love the family friendly ideas. We’re not into scary around here 🙂 Thanks so much for sharing at After School! Love to see you linking up! Great ideas – love the tape idea. The spider bowl is also a favourite.